The cold fronts get colder, and that sends a lot of people migrating to smaller latitudes. And while some want to engage in gluttony and laziness on some beach resort, some of you want a little adventure. So how ’bout hiking up to the top of a dormant volcano that neighbors a smoldering one? Compass Points is gonna help you get there. Cerro Chato steeply rises from Costa Rica’s Parque Nacional Volcán Arenal like a fortress wall, and if this mountain stood on its own, Cerro Chato would not have to share the attention. Unfortunately, you know, active volcanoes tend to be the celebrities wherever they’re found, and here is no exception. 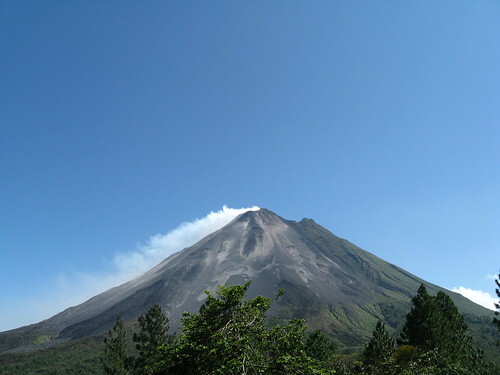 Arenal rises to a nearly perfect volcanic cone, and from resort windows and observation decks, tourists can watch smoke billow out of its 5,400-foot-high mouth and boulders the size of cars tumble down its slopes. So, okay, Arenal’s fairly awesome to stare at. And in the hike I’m about to describe, you’re going to have constant views of the volcano, but one look at it tells you that you are most definitely not going to stand on its summit. But, you can ascend Cerro Chato. Stop at the Arenal Observation Lodge ($8 entrance fee), about 11 miles west of the town of La Fortuna along Route 142. You can pick up a trail map at the lodge. There’s plenty to see in the national park, including an impressive waterfall and several cattle farms, as you make your way to the foot of Cerro Chato along the hiking trails. With a stop at the waterfall, my wife and I made it from the lodge to the base of Cerro Chato in about one hour of mostly flat walking (the only exception was the short drop into a ravine to the waterfall). Cerro Chato stands at about 3,742 feet high, and it last erupted some 3,500 years ago, according SummitPost.org. I’ve seen several Web sites recommend you take 4 to 6 hours for the hike, and I would say that’s accurate. You’re going to spend a good one to two hours even if you’re in great physical shape ascending the mountain, and the unrelentless trail is muddy and rooty as it passes through the rain forest. Keep your eyes open for salamanders, bugs with four hundred dozen legs, monkeys, snakes and so on. Once you reach the summit, the trail bears to the left, and then it steeply drops into the crater. 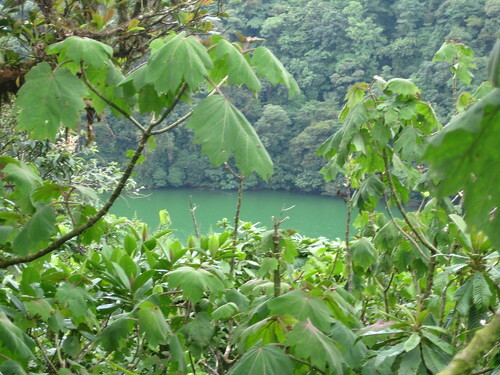 You’ll begin to see views of the emerald green lake that rests inside the Cerro Chato crater. Take plenty of water. The jungle gets stifling hot, even during the dry season. Stick to the trail and don’t try to bushwack you’re way. If you’re up for a body slam of a hike, I recommend giving Cerro Chato a try. At the very least, you won’t be sharing with dozens of tourists views of a remarkably green lake amongst a jungle crater created by a violent volcano explosion several millennia ago. I’m talking about bragging rights. 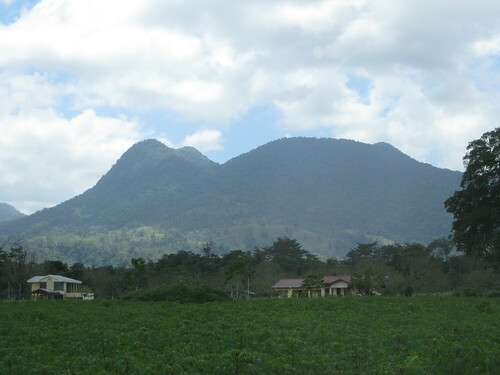 Click here for my story about hiking Cerro Chato: Green and serene (eventually). Below is an episode of Compass Points filmed at Cerro Chato from April 2009. Hopefully, it will give you an idea of what you’re in for should you decide to challenge Cerro Chato.